Be part of the best chess camp in Richmond! Our camp features a custom chess curriculum developed from a broad range of resources, including ideas from Aron Nimzowitsch’s My System, Jeremy Silman’s Amatuer’s Mind, materials from the Kasparov Foundation, tactical puzzles, classic games and miniatures—as well as examples from our own scholastic games illustrating important ideas, missed opportunities, and common mistakes. 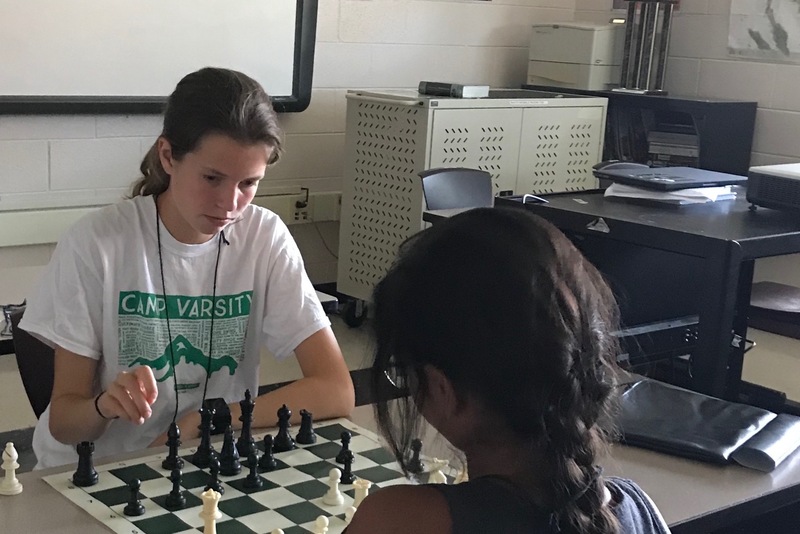 Younger campers just starting out will partner with a camp counselor ‘chess buddy’ each morning and travel from session-to-session together. 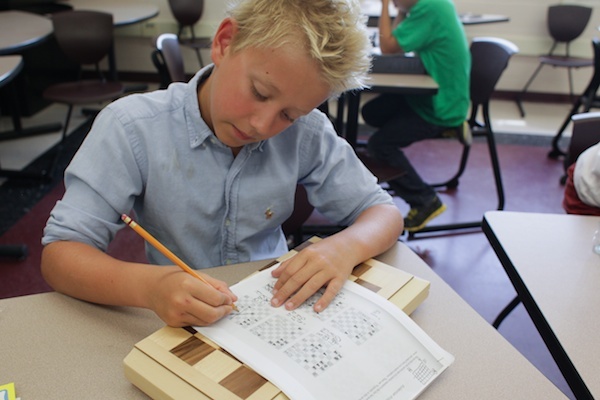 Campers learn in both a classroom-style and one-on-one hand’s-on setting. Each camper receives a t-shirt, chess book, and personalized binder with learning materials, game analysis to keep for future reference. Hours: 9:00 AM–3:00 PM; additional after-camp care is available from 3:00–4:00 PM at no additional charge. Cost: $275 if registration and payment are received before June 1, 2019. 225$ additional sibling enrolled on or before June 1, 2019. $325 after early registration (until July 1, 2019). $275 additional sibling enrolled after June 1, 2019. What to Bring: Bring your own lunch, your chess set and chess clock (if you have one), and a desire to learn chess! Healthy snacks are provided during breaks. How to Register: See our registration page for complete information and registration form. Our camp features three separate learning tracks suited to address each level of chess experience. Choose the track that’s right for you, and we’ll help you on your way to better chess! Chess Crash Course: The session is a one-week course designed to help players build a solid chess foundation. Once campers have finished the crash course, they will begin to learn new opening techniques and middlegame strategies. Checkmate Clinic: This course is designed to help younger tournament players discover their individual playing styles, as well as learn new ones. While players will develop their opening repertoires, they will also be exposed basic endgames as well. Tactical Tune Up: Campers starting out in this session should have already played some tournament games and have a USCF rating of about 800+. In this course, players will learn to enhance their tactical motifs with positional ideas. This class will specifically focus on the importance of space and pawn structures. Our goal is to help your child master each phase of the game. 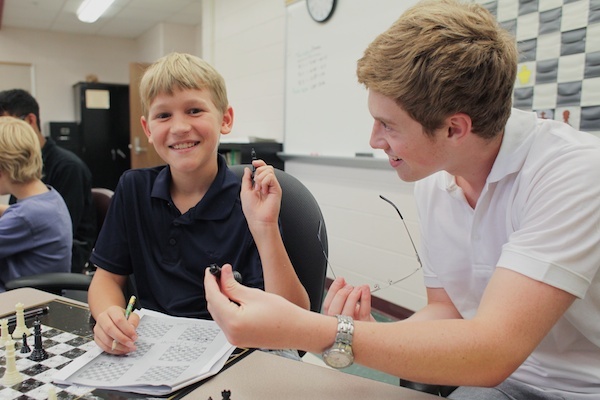 One-on-one instruction in the Chess Crash Course and Checkmate Clinic sessions will help your child progress quickly through the basic and introductory material with the goal of advancing into a higher session. Tactical Tune Up campers will spend a portion of each day playing, reviewing and analysing games. Actual camp schedule varies slightly each day. Drop-Off: Campers enter through the Bluestone Lobby (at the rear-entrance of the school, off West Leigh Street) and meet camp faculty and staff in the cafeteria for morning roll-call and announcements. Morning Session: After an initial skills assessment on the first day, campers are divided into three groups. Tactical Tune Up campers play a round of chess in the ‘Dragon Challenge’ using a G/25 time control. Students finishing their game early work with a tutor to review and analyze their game. Checkmate Challenge campers work on honing their middle and endgame checkmate techniques. Chess Crash Course campers start with the foundation of pawn and piece movement, and game-play. Late-Morning Session: Campers go to their assigned classrooms. Instructors will cover a skill level-appropriate topic divided between classroom-style learning and hands-on exercises. Lunch: Spend some down-time chatting with friends in the Cafeteria. Afternoon Session: Campers go to their assigned classrooms. Instructors will cover a skill level-appropriate topic divided between classroom-style learning and hands-on exercises. Free Play: Students play outside on the athletic field (weather permitting) or in the cafeteria. If some students did not have their ‘Dragon Challenge’ game analyzed, they are allowed to meet with tutors during this time. Pick-Up: Students are to be picked-up promptly by 3:05 PM at the Bluestone Lobby. Free Play (Daycare Option): Campers will participate in outdoor games on the athletic field (weather permitting), or other games in the cafeteria. Pick-Up (Daycare Option): Students are to be picked-up promptly by 4:00 PM at the Bluestone Lobby.